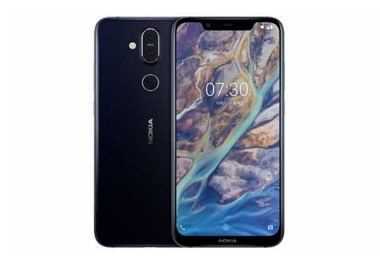 Latest price of Nokia 8.1 128 GB With 6 GB RAM in India was fetched online from Flipkart, Amazon, Snapdeal, Shopclues and Tata Cliq. "Nokia 8.1 with Snapdragon 710 SoC Goes on Sale in India Today"
Nokia, a Finnish telecommunication giant, was at one time one of the pioneers in the mobile industry. However, with the more modern Android smartphones taking over, the market share of Nokia in the smartphones/mobiles category took a huge hit. However, the smartphone company rose back with the launch of its Android Smartphones. Readily available, this phone has a Zeiss-branded dual camera system, with a primary 13 MP rear camera with an AMX363 sensor, f/1.8 aperture for taking photos in low-light conditions. Furthermore, a secondary 12 MP sensor is included. Both cameras support OIS and EIS, with 2PD. Additionally, the selfie camera in front comes with a 20 MP sensor and f/2.0 aperture. Along with a great camera is the need for adequate storage to store those videos and pictures. The smartphone comes with two memory options 64GB (4GB RAM) and 128GB (6GB RAM). Both the options are expandable up to 400GB using a MicroSD Card. The phone comes powered with a 3500mAH Li-ion battery. The battery on full charge promises a 2-day battery life thanks to the smart battery saver AI in Android Pie v9.0. The phone is equipped with a FullHD (1080 x 2246 pixels) display of 6.18”. Moreover, the phone supports a 1:1500 contrast ratio to give life-like images on the screen for the immersive viewing experience. The device further boasts an edge-to-edge notch display in front, 2.5D curved glass on both sides. Moreover, the Nokia 8.1 supports the standard 4G VoLTE network, dual Nano SIM facilities, a capacitive touchscreen, Corning Gorilla Glass 3, fingerprint unlock features and IPS LCD screen. Connectivity includes Wi-Fi, radio, GPRS, NFC, USB and 5.0 A2DP Bluetooth. It's truly a device from which you can "Expect More". Lastly, the phone runs on Android Pie v9.0 which promises to bring out the best in the smartphone.